Diabetes Manag (2018) 8(2), 038–40. Lysulin™, a new supplement for Nutritional Support for People with Diabetes and Pre-diabetes (those at risk of developing diabetes). We have presented data which illustrates that Lysulin does lower blood glucose and HbA1c after just one month of use. Int J Diabetes Complications, (2018) 2(3). Largest Reported 3 Month Drop in HbA1c for a Newly Diagnosed Patient with Type 2 Diabetes. Hba1c dropped from 12.8% to 5.4% in 3 months. This report of a large drop in HbA1c is extraordinary and shows the promise of adding Lysulin to other oral diabetes medicines to achieve outstanding glycemic control. Am J Clin Nutr. 2009 90 (2):314-20. “Lysine ingestion markedly attenuates the glucose response to ingested glucose without a change in insulin response”. Diab/Metab Res Rev 2008 24: 64-73 – Four month study with diabetic rats. Lysine inhibits protein glycation and lowers blood glucose. Diabetologia (1993) 36: 797-801- Diabetic rat study. this study has demonstrated that lysine treatment in chemically-induced diabetes is capable of reducing glycated proteins and it could potentially delay the appearance of the late pathologies associated with diabetic hyperglycemia and aging. Med Sci Monit, 2002 8(3) 131-137. In study with 77 Type 2 patients divided into 4 groups. HbA1c dropped from 9 to 8.2% in group taking lysine. Exp. Eye Res. (1998) 67, 597-601. While the blood sugar levels remain high in the diabetic controls, there was a phenomenal reduction of blood sugar levels in lysine or amino acids-fed groups. Lysine in particular has the prospect of therapeutic value in the control of diabetes. Normal levels of glycosylated hemoglobin in groups III and IV confirm diabetic control by lysine. The mechanism may be mostly through scavenging of glucose by amino acids. All the diabetic rats developed cataract (Fig. 1) at the end of 70-90 days. Interestingly, four out of six in group IV receiving lysine alone or amino acids orally did not develop cataract. Dietary intake a mixture of essential amino acids, chiefly lysine, may ward off or delay cataract formation. Complementary and Alternative Medicine (2015) 15:193, It was concluded that, lysine attenuates pancreatic tissue injury induced by L-arginine by inhibiting the release of the inflammatory cytokine as IL-6 and enhance antioxidant capacity. Eye Res 1993 56, 623-628. Lysine and glucose undergo non-enzymatic glycation ay physiological pH and temperature with glucose and compete for this reaction with lens proteins. Lysine lowered the extent of glycation of lens proteins significantly in glucose-treated homogenates of normal lens from humans. Scavenging of intracellular glucose and thereby protecting the lens proteins from excessive glycation appears to be the mechanism of action by which lysine could exercise a beneficial effect on cataract formation. Zinc Lowers Glucose and Glycated Proteins and Improves the Lipid Profile. Journal of Diabetes (2017) doi: 10.1111/jdb.12621. Usage of Zinc in pre-diabetes: A clinical trial. 200 patients with prediabetes studied in a double-blind study. “The FPG, OGTT, total and LDL cholesterol were significantly reduced in the Zinc group, with significant improvement in β-cell function.” LDL dropped by 28% and beta cell function improved by 57%. In a 2 year follow up, fewer patients on zinc went on to develop Type 2 diabetes; 11% on zinc versus 25% in control group. Glycated Proteins are the Cause of Many Disease Complications. CURRENT SCIENCE 2002 83: 12, 1515-1521. The findings of the UKPDS which indicate for every 1% increase in glycated hemoglobin levels, a 37% increase in microvascular disease was seen. SLEEP 2006; 29 (3):329-333. The formation and accumulation of advanced glycation endproducts (AGEs) has been implicated in the progression of age-related diseases such as diabetes mellitus and atherosclerosis. We hypothesize that AGE concentrations may be increased in subjects with obstructive sleep apnea (OSA). Serum levels of AGEs were increased in nondiabetic subjects with OSA and were associated with the severity of OSA. Natl. Acad. Sci. 1995 92 3744-3748, We conclude that AGEs may contribute to the increased severity of stroke associated with diabetes and other conditions characterized by AGE accumulation. Diabetes Spectrum 2015; 28 (3): 201-208. 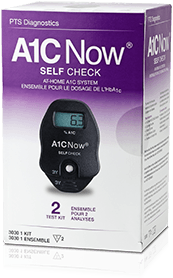 Selection an A1C Point-of-Care Instrument. All devices must meet quality measures set by the NGSP for clinical results to be considered reliable and accurate. Currently, the DCA Vantage, Afinion, and A1CNow devices have met NSGP criteria for analytical performance, which makes them acceptable options for POC A1C testing. J Diabetes Sci Technol. 2016 Oct; 10(6): 1303–1307. Average RBC life span is 80 ± 10.9 days. Of HbA1c change toward treatment goal value, 50% is reached in about 30 days.